It's still early, since the Racing GB is still running and I am fighting with my last submission - but I have plans for an IDS Tonka in post-Millenium CAF colors. The idea behind this is that Canada might have needed, beyond the CF-188/F-18 as interceptor, something for the maritime attack role, much like the German Marineflieger Tornados? 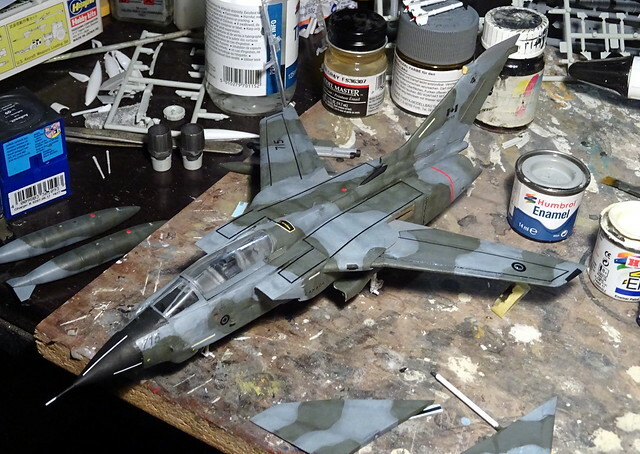 Basis will be the late (and apparently very good) Revell Tornado IDS, built with just some cosmetic changes, appropriate ordnance and a proper CAF paint scheme. I always loved seeing RAF Tornados with Sea Eagles, but one with Harpoons would look great I bet. 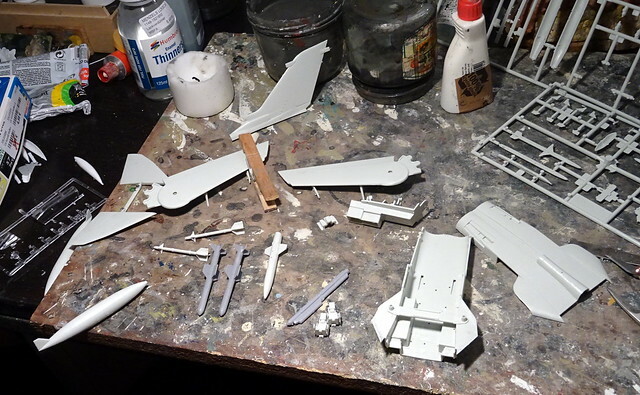 More small steps: assembled the cockpit tub, the wings with the moveable pylons, the stabilizers, BIG fin and the VG mechanism. 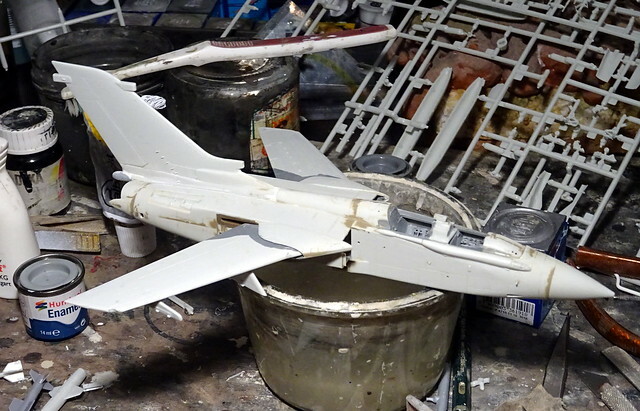 Since this Tonka will be slightly "Americanized", I deleted the thrust reversers and implanted a pair of F414 engines. 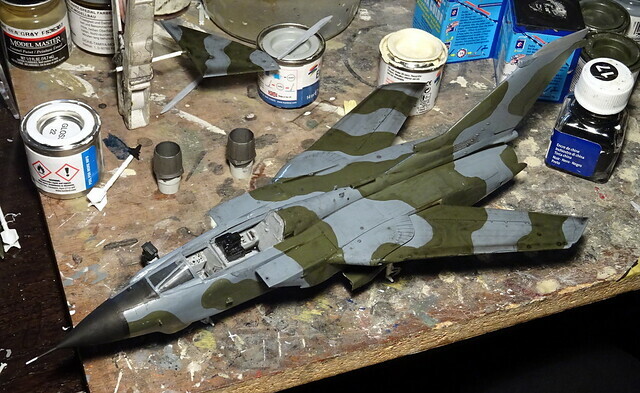 Steady progress, in the meantime the Tonka stands on its own feet and I am closing in on the painting phase, even though there's still some surface detail work to do. While I appreciate the modern Revell kit that I am building, it certainly has its flaws. One issue are the instructions, which are, at times not precise and probably even wrong. The air intake assembly steps appear quite fishy, and I am amazed that the kit does not come with a kind of walls inside of the intake trunks - you can actually look inside and see the VG mechanism? Furthermore, the wings gloves are very thin - I had a hard time glueing the upper an lower fuselage halves together, and make them stick. It took three attempts and the eventualy use of superglue to hold the parts together, plus several PSR tours. And, finally, this Tonka kit has even a worse solution for the stabilizers than the older Italeri kit. 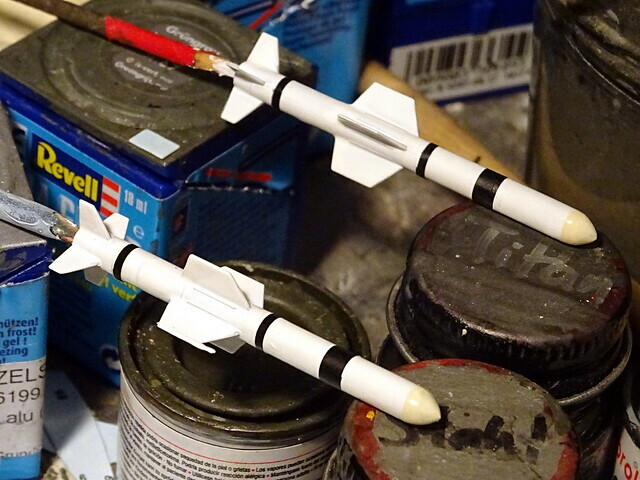 I wonder why no one can simply design a pair of stabilizers with an axis between them - the Italeri Tornado is already prone to losing the stabilizers after light contact with anything, but the later Revell kit is EVEN WORSE! 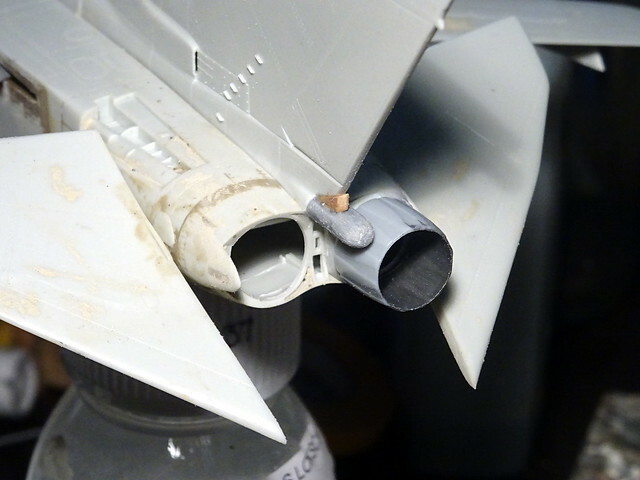 The connecting axis part/thing is so thin and wobbly, it was already a wonder that I got the parts into the rear fuselage without accident... However, it soon fell apart, and I replaced the sh!it with a metal axis. The whole thing appears to me like the Revell Me 262 kit: nice, good detail, but uber-engineered to a point that it harms assembly. 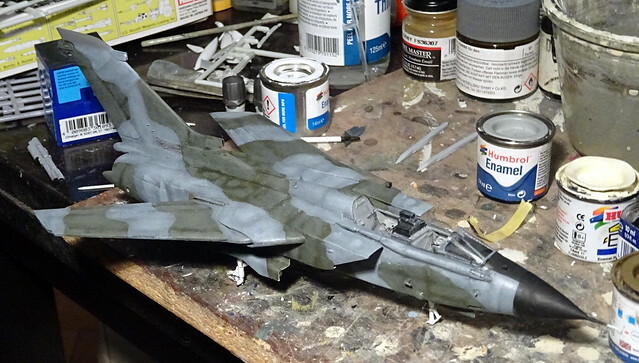 Very slow progress, and further fights with/against the Revell kit (e.g. 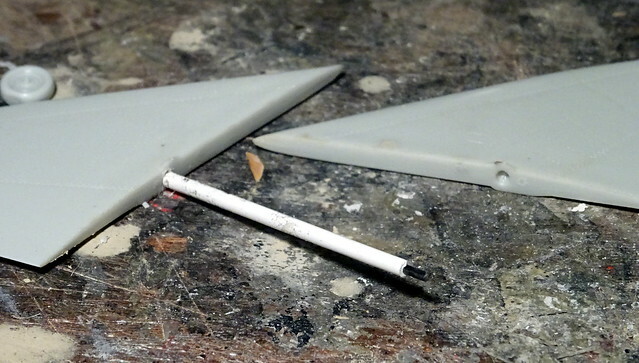 the windscreen, and one of the pylons fell out of the hole in the wing - despite a safe-looking clip mechanism inside?). Painting has started, though, and I am curious how the livery turns out? Other than the slow progress part, this idea sounds GR.eat ! Progress remains slow, because the kit/model stubbornly resists any collaboration. 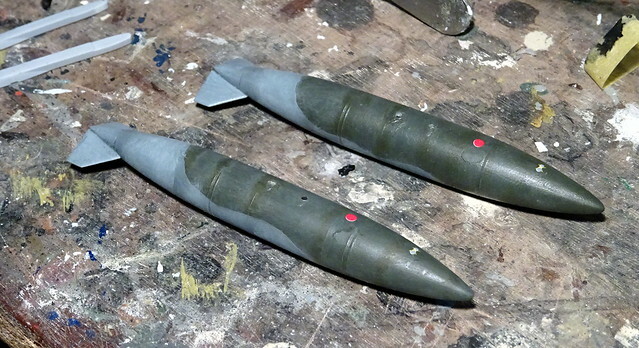 Now another wing pylon fell off, this time the wee axis broke, and so I ripped them all off - they will be mounted in fixed position later. I've come to hate the Revell kit - or better those behind it who thought they were smart engineers. Piece of sh!t, IMHO. My sentiments exactly...I'm doing the F.3 and it is one of the worst "new" kits I have ever seen. I will be glad to see it done. I assume that your F.3 kit is the Italeri mold, which has been re-boxed under the Revell and Tamiya label, too? Well, the Revell IDS is WORSE concerning assembly. It is rich with detail, has a much better cockpit and landing gear, but what is that worth when the thing does not go together...? Kept on fighting, though, and I got the major painting finished last weekend. That actually sums up a lot of recent Revell kits, the detail is exquisite but the assembly is over complicated and the fit leaves a lot to be desired !. However it could just be that actual kit you are doing, occasionally you get a lemon that just seems to fight you all the way for whatever reason and just never seem to work right. Well, I rather think that it is flawed by design, literally. The clear parts hardly fit, either, BTW. Pulled my self together and started decalling. In order to keep anything toned down, I used generic, black decal strips to create walkway lines. 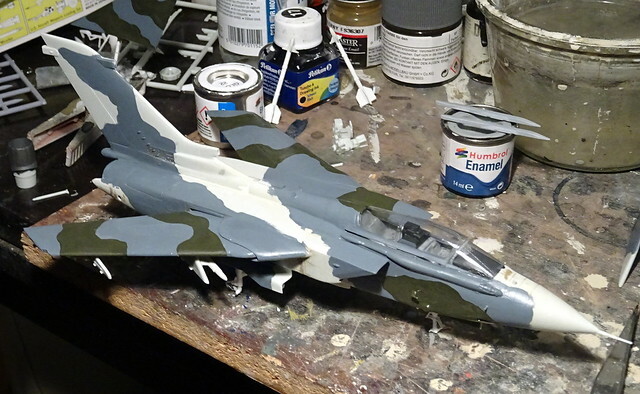 Most markings come from Leading Edge decal sheets (for CAF CF-116 and 188), and I also used some OOB stencils - and the latter immediately silvered... Tried to save the sitiation with decal softener, and it helped a little.